Twitter’s finished being a rebel, at least when it comes to standing up for a James Dean fan who is being sued by a celebrity licensing company that wants to claim the fan’s @jamesdean account. Despite Twitter’s earlier claims that the account, which consisted of quotes and photos of the late Hollywood bad boy, did not violate its trademark policy, the company quietly suspended the account sometime in the last few weeks. 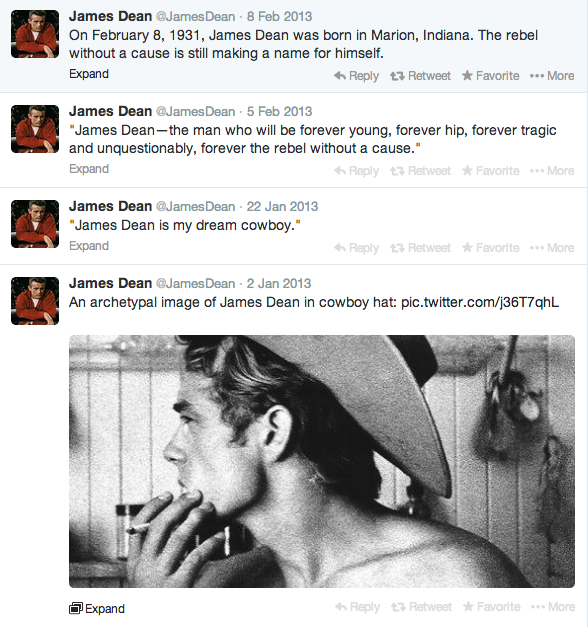 CMG Worldwide filed the lawsuit late last year, claiming that the @jamesdean account infringed on federal trademark laws and Indiana rights of publicity. “We looked at it as a positive sign that as the litigation moves forward, Twitter has suspended the site. No, there isn’t any judgement yet,” Mark Roesler, CEO of CMG, stated via email. Twitter, which has a reputation for defending its users in court, said it does not comment on individual account actions for privacy and security reasons — meaning it’s unclear for now if it has agreed to tell CMG who ran the @jamesdean account. Should the dead have publicity rights? The case is important because the outcome could limit how people use historical and fictional characters as part of their social media accounts. It also raises policy questions about the wisdom of extending rights of publicity — which are separate from copyright — to dead people. In contrast to states like New York, which doesn’t recognize a posthumous right to publicity, CMG’s home state of Indiana awards 100 years of protection. It’s unclear how such laws, which typically are used to protect physical products like masks and other merchandise, apply to Twitter and other online realms — and to what degree CMG can enforce Indiana’s law beyond the border of that state. “With posthumous rights, what’s really bizarre is that publicity rights grew out of privacy rights — this notion that someone has a privacy right after you’re dead is odd,” according to intellectual property attorney, Jonathan Band. Others are concerned about the potential harm to free speech of expanding these laws. “The real implication is for artistic expression,” said Ken Paulson of the First Amendment Center at Vanderbilt University, noting that Andy Warhol built his career on celebrity images. Paulson is also skeptical of awarding property rights where none existed before, and where there may be no moral or economic justification for doing so. “The broader question is how does society benefit from ensuring that James Dean’s great-great-grandson earns money from his likeness? Why build a system that would allow that to happen?” he said, noting that the heirs of figures like Daniel Boone or Davey Crockett don’t appear to be short-changed by their likeness being public. Roesler of CMG justified the expanded rights on the grounds that dead celebrities can be akin to commercial brands that are entitled to long-term protection. The James Dean account got deleted right after it changed its profile to ”Official James Dean account.” it changed real quick maybe 2 days after and then it was gone. You may have missed it. Before that it never said that line and the fan of that account only changed it to ”Not Associated” as in ”Fan account” after being sued. So, It wasn’t until it said ”Official” it got deleted and the background and profile image changed to different James Dean photos along with it. Who did this i wonder? why would the fan do it if he knew it would be deleted? he never put that line since 2009. The fan behind james Dean didn’t seem to want to give up his account and i think he said somewhat it violated fans everywhere. Although he said that in the past he was willing to work with the estate and sent them his password, but the estate at the time didn’t do anything, and now all of a sudden the estate wanted it. It makes me wonder if the estate went in there and changed the profile and then it got deleted as its still pending an outcome as Twitter looked like it was on the fan/parody accounts side for once! I hope Twitter won’t take the estates side, it does not violate rights to allow to share photos/for education purposes etc. The only thing is you can’t sell anything. The estates are GREEDY and making the only group (FANS) that buy from them not WANT TO BUY FROM THEM. Estates need to make their own accounts with a name avalable and not think it can steel whatever name it wants. This is the social media era. Steve Martin has @stevemartintogo not @stevemartin for a reason. You can’t take someone elses pick first. Whats next then? you can’t let big companies think it controls everything. Twitter needs to stand their ground TO allow fan/parody accounts. Its a huge part of twitter, not just the living celebrities it gots. I hope the fan is able to come back to his account. i own a fan account there and never really conversed with him but we followed each other. i got lucky and got my account back, but i wont say who it was on, BUT i’ve been there. i WRRY NOW THOUGH BECAUSE NOW ALL ESTATES FOR MANY CELEBRITIES will harass fans and twitter now if Estate wins. CMG also tried to completely control use of Marilyn Monroe’s name, even going after photographers that worked with her. A lawsuit that pitted California versus New York laws vindicated the photographers. Even copyrights of famous books and films become public domain after a certain time lapses, though they retain their artistic and commercial value, which is why Google can publish many of them in the Books website. The odds are this Twitter user can’t afford high-powered IP law firms to keep his account, however by most laws tribute accounts that aren’t commercial are fair use, at least from the standpoint of using copyrighted photos of some celebrity. Even when you own a photograph copyright there is little you can do to keep bloggers from using them. This should be interesting as it develops since there are dozens of fake supermodel and actor profiles on Facebook, even though that violates their TOS. Ken Paulson asks, â€œThe broader question is how does society benefit from ensuring that James Deanâ€™s great-great-grandson earns money from his likeness?” The broader question for who… navel gazers? How does society benefit from anybody mentioned in a will, or who otherwise inherited the intellectual property of a forebear, including the forbear’s iconic franchise. Does Mr. Paulson believe Nancy Sinatra, for another famous example, has no claim to earning money from her father’s intellectual property? Converse to Mr. Paulson’s precious position, one might equally ask, how does society benefit from depriving its denizens of what may be rightfully theirs? Publicity rights aren’t intellectual property.